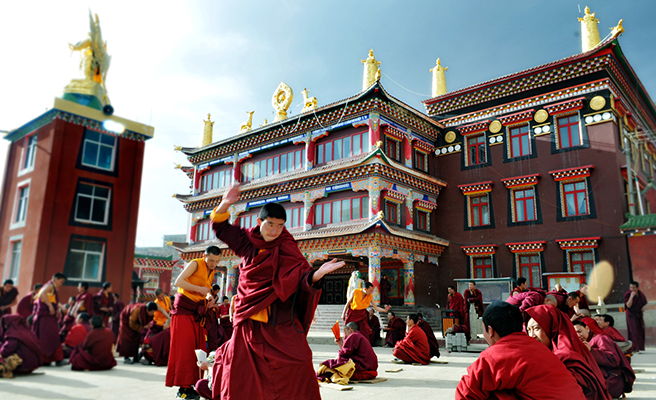 Larung Gar Buddhist Academy was established in 1980, founded by H.H. 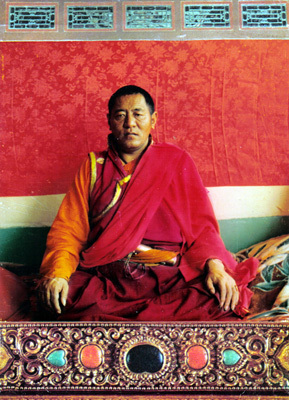 Jigme Phuntsok Rinpoche. Since then, it starts to become one of the largest and most influential centers for the study of Tibetan Buddhism in the world, which is made up of monks, nuns, lay “vow-holders” of both Tibetan and Chinese origins. 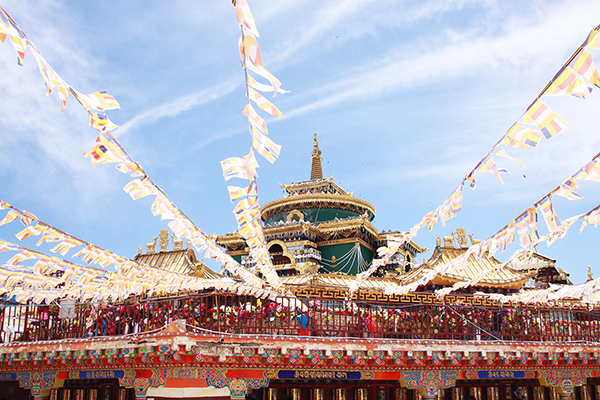 In 1980, His Holiness Jigme Phuntsok Rinpoche—moved solely by the intention to benefit sentient beings by preserving and promoting the teachings and practices of the Buddhadharma—established a sanctuary, school and residence for students in the Larung valley of Sêrtar County, Garzê Prefecture, Sichuan Province, China. 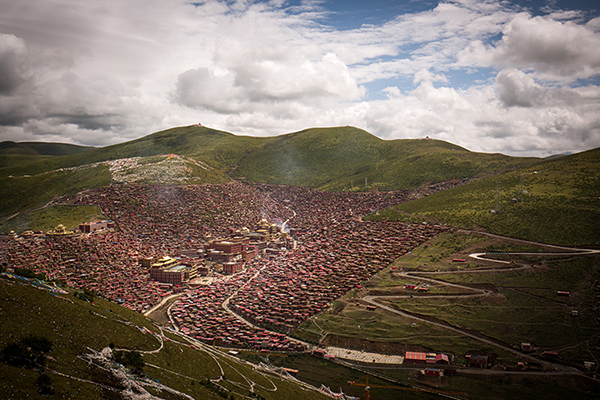 Nestled in a valley within 4000-meter high Qinghai-Tibet Plateau mountain range, Larung Gar Five Sciences Buddhist Academy is comprised mainly of small red huts, most of which were hand-built by residents. From the air, the area appears like a brilliant red lotus emerging in full blossom from a snow-covered region. The center of the valley is occupied by teaching halls and a golden-winged statue of a Garuda—a legendary protector of the Buddha, depicted as a giant bird grasping in its mouth a snake (used representing people or other forces that seek to harm or obstruct teaching of the Dharma). The Larung valley has long been regarded as a sacred place, imbued with the blessings of many advanced meditators of previous eras—including the great Nyingma master, Dudjom Lingpa. It is said that thirteen of his most accomplished students achieved such a high state of realization there, that they attained what is known as “rainbow body”- during which their physical body dissolved into light. At the very beginning of establishing the academy, His Holiness determined the school’s principles of teaching and training, which are: “Unity and Harmony”; “Pure Precepts”; “Listening, Reflecting and Meditating”; and “Spreading the Dharma to Benefit Sentient Beings”. Guided by this four principles, His Holiness initiated another era of revitalizing the Buddhadharma. The Academy also embodies the principles of the Rimé — or “non-sectarian” —movement that emerged in the 19th century, due in large part to the efforts of two learned and charismatic Tibetan masters: Jamyang Khyentse Wangpo (1820-1892) and Jamgön Kongtrul Lodrö Tayé (1813-1899), who with strenuous efforts promoted acknowledgement and appreciation of lineages’ differences. In this modern age, this spirit was sincerely embraced by His Holiness Jigme Phuntsok Rinpoche and Khenpo Sodargye Rinpoche. In keeping with the principles of the Rimé tradition, all students and visitors at the Academy are treated with equal respect: regardless of their status as monastics or lay practitioners, gender, ethnic or national heritage, or educational achievement, all are welcome to receive the teachings articulated more than 2500 years ago by the Buddha and developed over the millennia by enlightened masters. The curriculum of the Buddhist Academy consists of two major areas: Sutrayana and Tantrayana. Sutrayana is focused on the systematic study and practice of the Five Great Treatises: Abidharma, Vinaya, Buddhist Logic, Madhyamaka and Prajñāpāramitā. Tantrayana comprises of the study of a variety of Tantras, and the practice of Generation Stage, Completion Stage, Great Perfection and various pith instructions from lineage masters. Besides, there are also worldly curriculum being offered, such as Tibetan Medicine, Astronomy, Tibetan Calligraphy, Rhetoric and Rhythm in Tibetan language, etc. In addition to providing opportunities for interested students from all walks of life, for over 30 years, the Academy has produced hundreds of Khenmos and Khenpos, learned women and men, who have established Dharma Centers around the world, spreading the messages and methods of compassion and wisdom taught by the Buddha, and sharing the unique heritage of Tibetan Buddhism and culture across the globe. Do not disturb other’s mind.